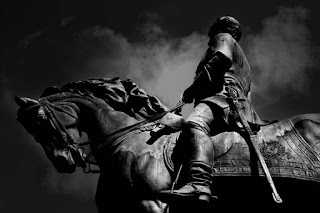 When I moved to Columbia earlier this year from my native South Florida, I was almost immediately inspired by the historical beauty of my new city. 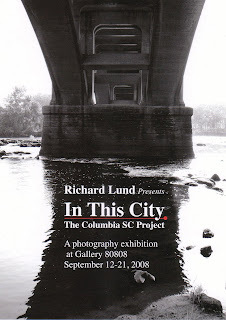 I soon began snapping pictures for what was to become my “Columbia SC Project”. I am fascinated by the State building with its powerful monuments and the pure beauty of the blooming flowers which adorn the city. I love to walk down Main Street to the Capitol and take in the unique, diverse architecture. And the Congaree River with its gateway bridge is one of my favorite landmarks. 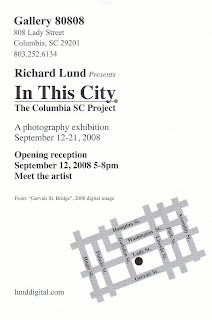 Please come and share my view of my city — Columbia SC — with me. The Show will consist of several large-scale 4 x 6 foot photos, an installation of 60 small detail photos, and many framed medium format photos. Please also visit the Gallery 80808/Vista Studios website.